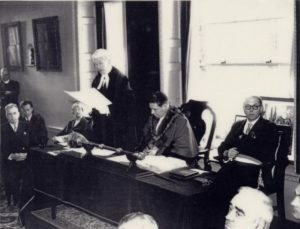 On February 28, 1959, a ‘Deed of Jumelage’ (Twinning) between Chartres (France) & Chichester was signed in Chichester’s Council Chamber by the Mayors of both cities J. Pichard Mayor (Marie) of Chartres and C.Newell Mayor of Chichester. This Deed is displayed in the Chichester Council House. The Deed was re-signed in 2009 at an event celebrating 50 years of twinning by Michael Woolley, Mayor of Chichester, and Patrick Géroudet, Deputy Mayor of Chartres. In 2019, the cities of Chartres and Chichester will celebrate 60 years of twinning. Close links have been maintained between the cities over this period, and social, cultural and economic links have been formed. A series of special events are planned for our 60th anniversary year of the Twinning in which groups from both cities will participate.